Have you ever noticed how a lot of the more traditional quilt patterns seem to be a version of a standard 9-patch quilt? This quilt pattern is called Panache, and can be found here. 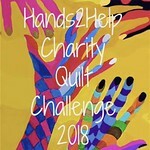 I had come across this design over at Hyacinth Quilt Design, which by the way, I love how she came about choosing the name for her blog. Most of the fabrics I used in my Puddy Tat quanket are new, with the exception of one that was left over from a quanket I had made for my Mom many years ago, and some 4″ squares I had gotten when I visited the Latimer Quilt and Textile Center in Tillamook in 2015. A couple of these cut squares had the maker’s mark on the edge, Aunt Jane’s RJR Fashion. It’s a cute fabric, with small pink, white and blue flowers (?) on a tan background. I am not sure if it is vintage, but I wouldn’t be surprised if it is – it has that look about it. This was donated to the County of Ventura, Children & Family Services, for a foster child in June 2017.